The mass shooting at Marjory Stoneman Douglas High School that left 17 people dead has sparked calls for pushing lawmakers to pass tougher gun laws. Students are becoming advocates for gun control, sparring with gun-rights activists on social media and calling for safer gun laws. In the wake of the tragic shooting at Parkland that painfully raked through the heart and soul of our state, Florida politicians, meanwhile, scramble to produce a legislation in response to the Feb. 14 attack that killed 17 people. But the students have vowed to become the face of a movement for tighter firearm regulations. The #MarchForOurLives is giving voice to a movement created by, inspired by, and led by students across the country who will no longer be silent and risk their lives waiting for someone else to take action. Students are planning to visit the state capitol in Tallahassee this week to demand immediate action. They are also calling for anti-gun violence demonstrations in Washington and other cities March 24. They are breaking the silence coming from our politicians after every mass shooting. They are impressively confronting the status quo, Congress, Senators – and even the President – who submissively go inert and keep silent. President Donald Trump response to the attack has been needlessly divisive. He has literally done nothing beyond a short trip to Broward for photo ops. Instead he has spent most of the weekend tweeting about whether or not there’s been collusion in the wake of the recent indictments by special counsel Robert Mueller; something that students who escaped the deadly school shooting, focused their anger, don’t seem to appreciate much. Emma Gonzales, a senior at Marjory Stoneman Douglas High School, has become one of those voices we needed to hear. She was in the school’s auditorium and assumed they were having a drill until first responders told everyone to run. On Saturday, at a federal courthouse rally in Fort Lauderdale to pressure lawmakers for gun control after a deadly shooting, she lead a student outcry on guns and pledged that her school would be the site of the nation’s last mass shooting. Her speech went viral and name trended on social media over the weekend. 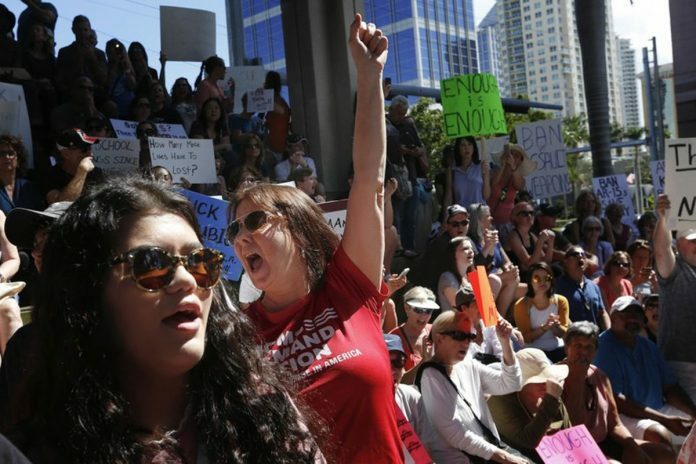 We join Ms Gonzales in the struggle for greater gun control, which the editorial board at the Florida Daily Post believes is exponentially needed. She said, she and her peers would take it upon themselves to “change the law.” As her impassioned voice trembled with outrage as she challenged President Donald Trump’s tweet drawing attention to the fact there were “so many signs” the alleged killer was “mentally disturbed”, she reminded us that very close to us, Donald Trump, Marco Rubio and Rick Scott are some of the politicians who are supported by the National Rifle Association – a hugely powerful organization which objects to any form of gun control. Now is the time to change that. Now is the time to make our voices count. No other student in our schools need to die, and if President Trump is serious about it as he read the teleprompter in his Friday speech, he should step up to the plate and help a tighter gun control legislation to pass. #MarchForOurLives: breaking the silence to confront the status quo, politicians, and the NRA. It’s time to listen to the voice of a movement created by, inspired by, and led by students across the country who will no longer be silent and risk their lives waiting for someone else to take action.